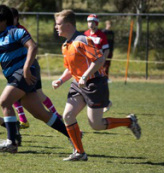 This page provides education and development information specifically aimed at the referees officiating U19 games. You can view referee video clips on the ACTRRA YouTube Channel. A monthly newsletter for referees officiating U19 games and is just another way to bring the young referee some concise and direct information about refereeing. It aims to up date any issues affecting you, some reminders about refereeing consistently, some emerging refereeing trends and some useful tips and tricks. The content of each newsletter are the topics and areas occurring in ACTRRA land and what our dedicated Referee Coaches are witnessing on the field.